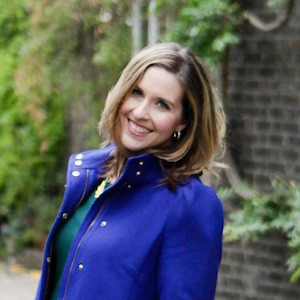 You are here: Home / Blog / Pastas / Creamy Pumpkin Pasta Means It’s Officially Fall! October is here and Fall is in full swing, but I’m not sure Mother Nature knows that yet. Right now in Kansas City we’re still having 80 degree days, but I’m pretty sure I could eat this week’s recipe any time of year. I decided this week that Creamy Pumpkin Pasta was a must, because it’s about time pumpkin made an appearance in 2017! Now last year I had made this crazy good Pumpkin Alfredo that I’ve been wanting to make again. However, this year I’ve focused on ways to get creative and cook without dairy, because I don’t want to eat it every day. So I decided to recreate this Pumpkin Alfredo but without the butter, cream, and cheese. 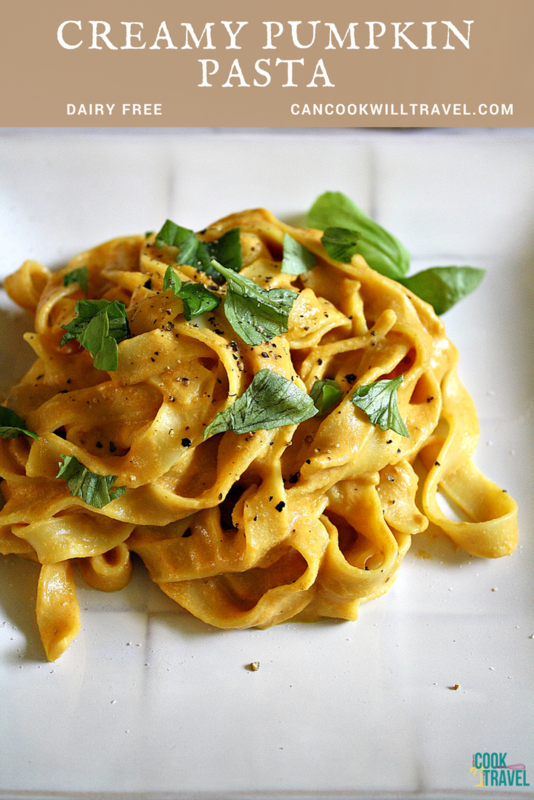 But without those ingredients, it’s hardly an alfredo, which is why I’m calling it Creamy Pumpkin Pasta. I changed up the dairy of course and then added some spice, because I think a bit of heat makes everything better. So in the end, this was more of a creamy, spicy sauce than a rich Alfredo, which is such a good thing. The original inspiration, while delicious, was very rich with the cream and cheese. And this one definitely left me feeling full yet not bloated or like I overdid it. Let’s talk sauce here for a moment, because it uses ingredients you may not use often. Or perhaps you do, which is great! I started off using Earth Balance Vegan butter, which works so well in both cooking and baking. To that I added lots of garlic and red pepper flakes, and then pumpkin puree and coconut milk get added. The coconut milk I used is the kind in the can and I bought the Trader Joe’s reduced- fat version. Admittedly I was kinda nervous about whether it’d work as well as the full-fat variety in place of cream. But it worked just as well, so I’d say you’d be good with either kind. Then once the sauce thickens a bit, in place of Parmesan cheese, I added Nutritional Yeast. This ingredient is gluten free, dairy free, etc, and adds a savory touch and thickens the sauce really well. Don’t be shy of adding salt and pepper, because you don’t have the salty Parm that the original calls for. And then my favorite ingredient to throw in on a whim is Jalapeño Tabasco sauce, because it always brings out the flavors. Trust me on that one! Taste and add more salt and pepper if you need to, and then toss in cooked pasta. I used egg noodles, because I was more concerned about the sauce than also using gluten free pasta. Now that I know it works really well though, I plan to experiment a bit on the noodle part. 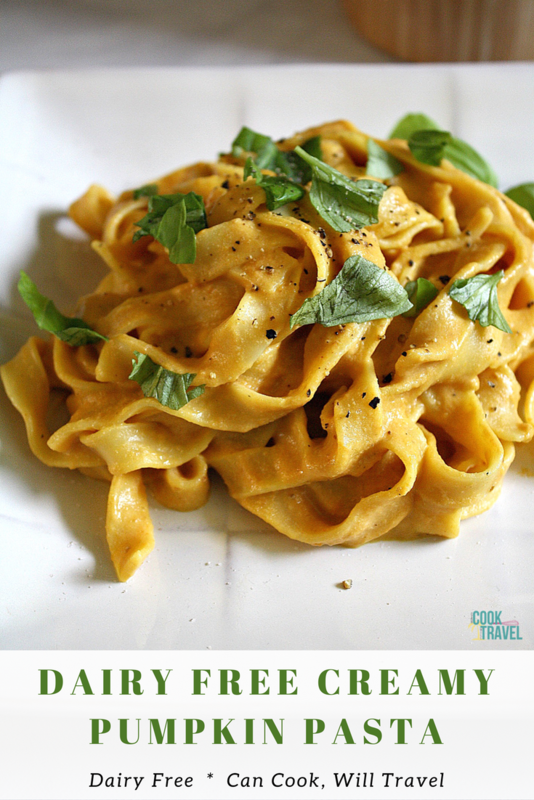 The sauce coats the pasta really well and you’ll just love how creamy this Creamy Pumpkin Pasta truly is. I say pair it with your favorite protein like a chicken breast, in my case, and dig in! 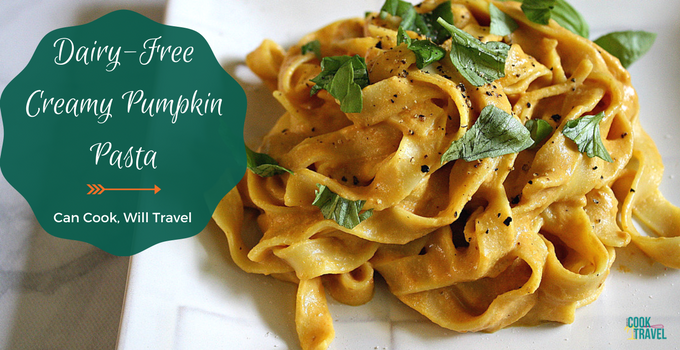 I have a ton of fresh basil on hand too, so I topped my Creamy Pumpkin Pasta with fresh basil to add some freshness. Also adding a sprinkle more salt and pepper takes this pasta over the top. Needless to say, a tiny helping of seconds occurred – yum! So when you have extra pumpkin on hand that you don’t know what to do with, then reserve a cup of it and make this Creamy Pumpkin Pasta STAT! Click that link for the recipe and step by step instructions, and happy Fall ya’ll! One year ago: Salsa Verde Chicken Enchiladas – Say Olé! Two years ago: How To Make Homemade Almond Butter – Could It Be Any Easier?! Three years ago: Jalapeño Popper Taquitos … Yep, That Happened!